My best friend, Marie, lives a block away and works at Trader Joe’s. Every week, she is going to bring over FOUR INGREDIENTS that are absolutely random and completely unknown to me. My challenge is to create a dinner with what she brings to me and what I have in my fridge, freezer, and pantry. We film the whole thing for you to witness, and we call it SWASHBUCKLED! Here is the first episode, followed by the recipes of what we came up with. I hope you enjoy, and let me know what you think about our new show in the comments! GARNISH: Icelandic Style Plain Yogurt (or greek yogurt, or sour cream) and sprig of rosemary. Cut chicken breasts into cubes. Season with salt and pepper then toss in All purpose Flour. In a large skillet, heat olive oil over medium high heat. Once hot, add chicken breasts and brown on each side (about 3-4 minutes on each side. Does not need to be cooked all the way through just yet). Remove from skillet and place on paper towel to remove some excess oil. In the same skillet, add sunchokes, fennel, garlic and lemon zest. Cook for about 5 minutes and then add lemon juice, chicken broth and white wine (peach simpler wines). Add rosemary and fennel fronds. Bring to a boil, then turn down to a simmer and reduce for about 5-10 minutes. Serve alongside grain of choice. Garnish with Icelandic Style Greek Yogurt and Rosemary Sprig. Mix together dressing ingredients. Rinse arugula, Brussels sprouts and fruit and dry completely. 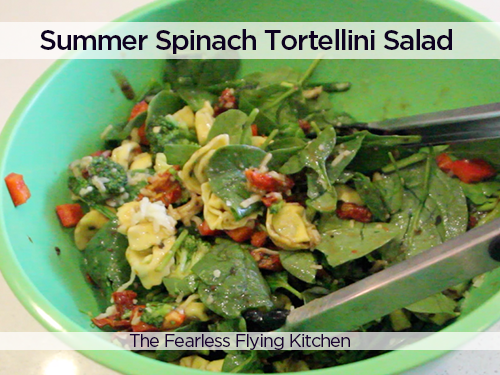 In a separate bowl, combine arugula, shaved Brussels sprouts, salt, pepper, and a few tablespoons of mixed dressing. Add fruit and toss well. Arrange on plate and add coconut and sesame seed clusters. I live in San Diego, home of the best Mexican food in the world (outside of Mexico, that is). We take our tacos pretty seriously around here and my family can get pretty snobby when it comes to Mexican cuisine. It is part of the reason we will never leave San Diego. Ever. Fish tacos are my husband’s go-to dish. There are so many great choices in San Diego, we usually go to Ranchos or El Zarape in North Park, but are always on the look out for new and delicious spots. (Comment with your favorite fish taco spot, and we’ll either try it or judge you) (half kidding – see above). One of my favorite tacos shops in San Diego is Lucha Libre, which is a hipster taco restaurant in Mission Hills (and North Park!) San Diego with a luchador (Mexican Wrestler) theme, amazing salsa, and a line out the door. Go there. They are awesome. But my FAVORITE item on their menu is the queso taco – Where they melt cheese on the griddle and make it all crispy, then put it on a corn tortilla and fill it with carne asada, avocados and a secret cream sauce. It is a little sample of heaven on earth. But healthy? Probably not. In true fearless flying kitchen fashion…I have to try to make the best in San Diego by combining everything I love about tacos (all while trying to make it a pinch more healthy). Why not do a mash up of this delicious cheese and meat filled taco with my husband’s favorite dinner? Meet the Queso Fish Taco. Grilled white fish (Tilapia or Mahi-Mahi, I used fresh tilapia from Trader Joe’s – Can’t beat the price either!) seasoned to perfection with chili and lime, a crunchy cheese and corn tortilla wrapper, leafy green cabbage slaw, home made guacamole. It really is the recipe for a perfect taco Tuesday…or any day..or, every day. First, I have to talk about my proudest discovery, which was mixing the Cruciferous Crunch Collection with the Cilantro Salad Dressing. I normally look at this salad mix when I am at Trader Joe’s and have never been inspired, since it seems too leafy and kale packed for my liking. But it is definitely worth the purchase. It could be great as just a regular salad tossed with a creamy dressing or used as traditional cole slaw, just with a leafier texture. Mix well, until combined, and serve as cole slaw, or top with your favorite toppings and enjoy as a salad. Next step, was some home made guacamole. Now, I can’t take too much credit here. I just copy the table side guacamole from El Torito. But it is delicious, and highly recommended. Salt and Pepper to taste (go easy on the salt at first and try it with a chip. Usually don’t need too much salt because the chips are salted). Most fish tacos you find out and about are breaded and fried. Not my favorite. We also don’t have an outside grill, so I did a hybrid of the two, and pan fried the fish with a bit of butter (but no breading). I also haven’t ever cooked Tilapia before. Mix everything except for the tilapia and butter together. Rub evenly onto the tilapia. Meanwhile, heat a skillet or griddle on medium-high heat and melt a pat of butter (or Olive Oil if you prefer. I like the flavor that the butter adds). Once the pan is hot and butter is melted, cook tilapia for about 4 minutes on each side. We ate our Queso Fish Tacos with pinto beans and watermelon. Other delicious sides include rice, grilled veggies, corn or a simple salad of bell peppers, tomato and cucumber with cilantro, lime, salt and pepper. See recipes above for Chili Lime Rubbed Tilapia, Fish Taco Slaw and Homemade Hibshman Guacamole. To assemble the tacos, heat a griddle on medium-high heat, sprinkle cheese on griddle, the same size as the corn tortilla you are using. It will melt and then start to crust, and it is in between these two phases that you pop the corn tortillas on top, for about a minute. The bottom will crust up and the top will stick to the corn tortilla. Remove with spatula and put on plate. Slice fish into large chunks and assemble on crispy cheese, then add your Fish Taco Slaw and Guacamole. Serve immediately and enjoy!